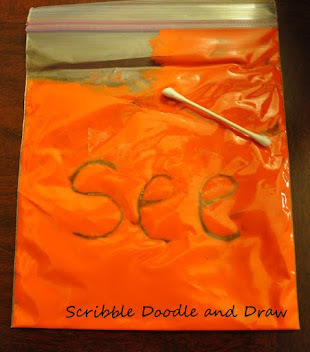 Build up those fine motor muscles with these fun Halloween activities for preschool and kindergarten. 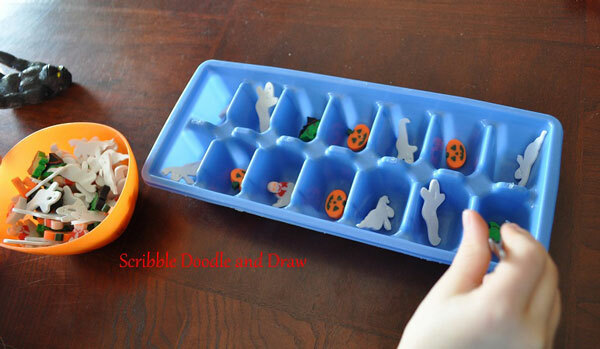 Have kids sort Halloween themed erasers into ice cube trays using tweezers. 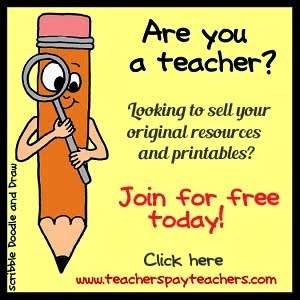 I try to encourage kids to use their "pinching fingers" and sort the erasers. I ask the kids group all the like characters into one section for example all the witches go in one section, all the ghosts in another. Or I have the kids make repeating patterns in the tray. 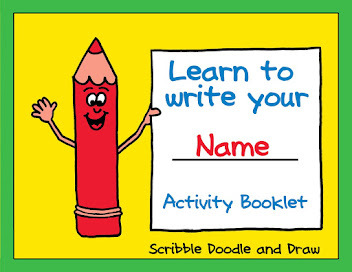 I buy the erasers on amazon or at the dollarstore and I buy a set for each holiday and season, that way I can re-use the activity by just exchanging the erasers! 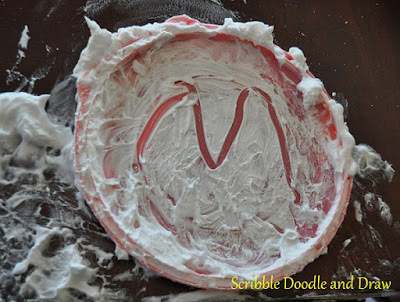 Another activity we like to do at Halloween time is draw letters in shaving cream. I squirt a bit of shaving cream onto a plastic plate and then I call out a letter and the kids draw the letter in the shaving cream. Then they move around the shaving cream to "reset" their plate. 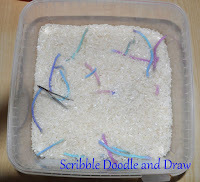 The kids love, love, love this activity but I have to say it does make quite a mess! Using a serving tray under their plate is a good ideas as well as a plastic table cloth and having them wear painting shirts is also a good idea. A bit of a mess but it's great printing practice! For a similar activity that is not messy, you could try printing on bags of paint as this would be mess free. 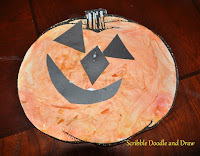 You can read about it in my post a creative way of making printing practice fun. Another great activity for strengthening the pincer grasp is picking up and sorting googly eyes, into small, medium, large. I spill out a handful of eyes to each student and they have to use their "pinching fingers" to pick each eye up and put them into the correct bowl (small, medium, large). 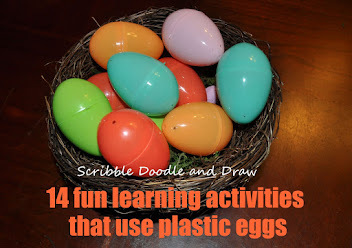 For kids that zip through this activity I have them use tweezers to move the googly eyes to the bowls. As an extension I have them make patterns with the eyes. Cutting skills are practiced by cutting "monster hair" or multicolored yarn. 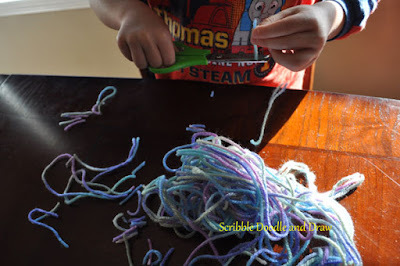 I have the kids cut up their strip of yarn into the color sections. They are then asked to sort the yarn based on color. 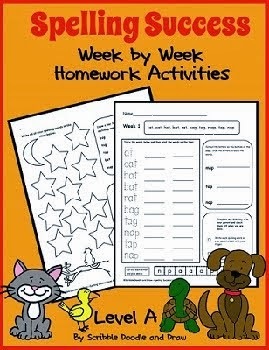 As an extension I have them count how many pieces of each color they cut and have them record it in their math journals.